ReadEZ Reading Guides are similar to overlays but are A6 sized and have a “pillar box” design with your preferred colour in the middle and darkened areas above and below. The Reading Guide fits easily over a page of text and not only provides you with your optimum colour, but helps you keep your place on the page. By making the areas above and below where you are reading darker, visual stress is minimised while still allowing you to scan ahead. 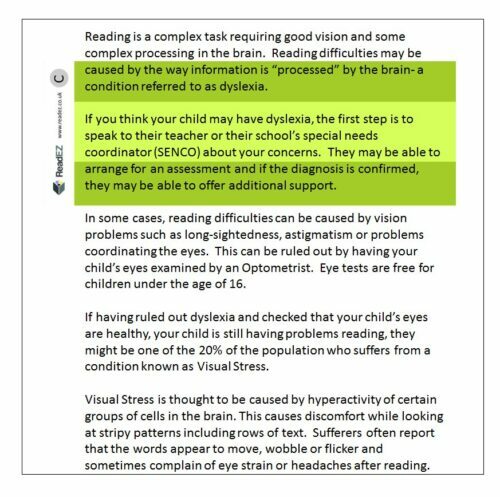 Reading Guides have been carefully designed by a team of vision scientists and the sizes have been optimised to allow those with Visual Stress to read comfortably and fluently. The Reading Guides themselves are made from durable acetate and come in packs of 5 A6 sheets making them ideal for reading pages of any size. If you already use an overlay, simply order the Reading Guide to the nearest colour from our range. 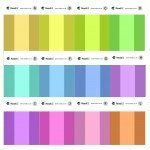 You can also use our Overlay Selector tool to confirm the optimum colour. If you are experiencing the symptoms of Visual Stress, you are advised to have a full eye examination by an Optometrist before using Overlays, Reading Guides or Clip-ons in order to rule out other possible causes. 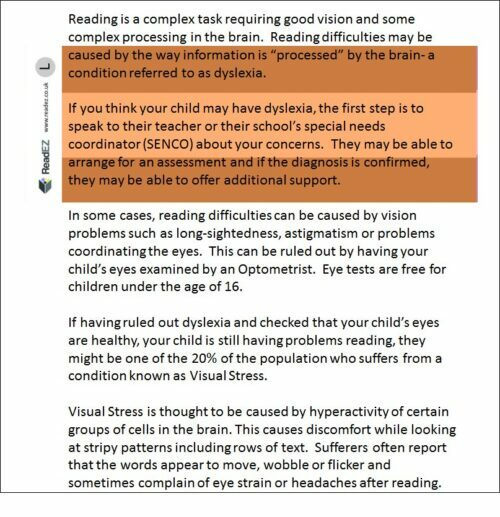 Many optometrists can test you for Visual Stress and recommend an optimum ReadEZ colour. If you have had a recent eye examination, you can use our Overlay Selector tool to see if reading is more comfortable with any specific colour. Overlays and Reading Guides are not expensive and many people find that reading is more comfortable using them even if they have not been diagnosed with Visual Stress. 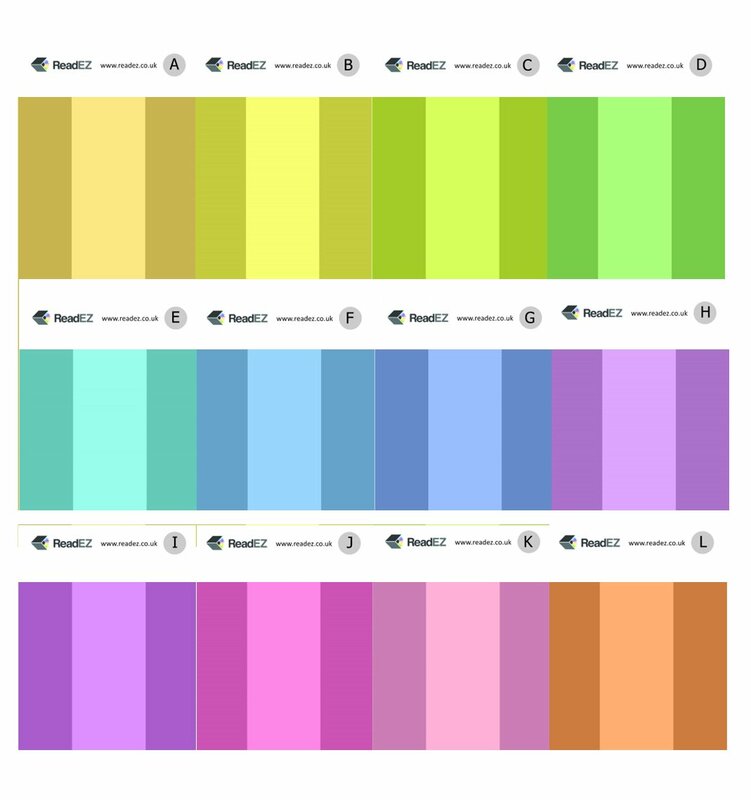 PLEASE NOTE: BECAUSE OF THE DIFFERENCES IN THE COLOUR REPRODUCTION OF DIFFERENT MONITORS, THE COLOUR OF THE READING GUIDES MAY DIFFER SLIGHTLY FROM THE COLOURS SHOWN BELOW.